By Bay Area Bird HospitalDecember 7, 2016Feathers, Furs, and Scales! 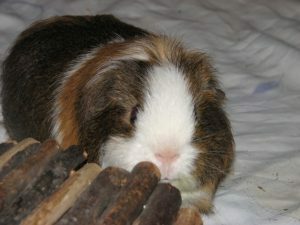 Oscar was a patient of mine who came in because he had some mild abnormalities – soft droppings, decreased interest in hay and some possible weight loss. His owner had started Critical Care before bringing him in. On exam he was definitely thin and his abdomen felt soft and doughy. We took an xray of Oscar and found a ton of gas in the intestines! Definitely gut stasis. His blood work was normal and we started Oscar on various medications. When he returned for his followup appointment, he wasn’t back to normal – more weight loss, still not eating well…Xrays showed improvements but not what we wanted to see so back onto treatments he went. We saw Oscar for other issues 2 months later – but the xray still showed gas! Since Oscar’s blood work was even better than previously we moved on to the next step. We found Oscar’s problem – both kidneys showed changes consistent with pyelonephritis (kidney infection). We put Oscar on 6 weeks of heavy duty antibiotics and his kidneys improved. There were no further episodes of weight loss or appetite changes. 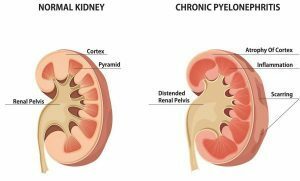 Some diseases, like pyelonephritis, are hidden. They don’t show up on xrays and they don’t make changes in the blood work until they’ve caused serious damage to organs. That’s where advanced imaging such as ultrasounds, CT scans and even MRIs can make all the difference. But, just like with Oscar, we don’t start there! Oscar didn’t get better as fast as he should have and he had the gut stasis return. At that point we could tell something wasn’t right – we were able to investigate further and find his hidden problem.